Approximately 80% of breast cancer occurs in women with no family history. Oestrogen affects the function of a number of target tissues and research has shown that an increased lifetime exposure to oestrogen is a strong risk factor in the development of breast cancer. 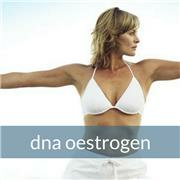 DNA Oestrogen tests for gene variants that have been shown to have an impact on how oestrogen is metabolised. Guiding the personalisation of diet, hormone and nutritional supplement recommendations, based on the insight gained from the DNA Oestrogen test, to improve oestrogen metabolism is of benefit to men and women who suffer from numerous oestrogen-dominant conditions and who have higher lifetime exposure to oestrogens, oestrogen metabolites and other carcinogens. CYP1A1: A phase I cytochrome P450 enzyme that converts environmental pro-carcinogens into reactive intermediates that have carcinogenic effects. It is further involved in the oxidative metabolism of oestrogens. CYP1B1: Catalyses the 4-hydroxylation of oestradiol and active polycyclic aromatic hydrocarbons (PAHs) and arylamines. CYP17A: Catalyses reactions involved in drug metabolism and synthesis of cholesterol, steroids and other lipids as an integral part of the oestrogen metabolism pathway. MnSOD: Provides anti-oxidant activity within the cell, necessary for decreasing oxidative damage caused by reactive oestrogen metabolites. GSTM1: Responsible for the removal of xenobiotics, carcinogens, and products of oxidative stress, which include reactive oestrogen metabolites. GSTT1: A member of a super family of proteins that catalyse the conjugation of reduced glutathione, and is responsible for removal of reactive products of oestrogen metabolism. COMT: Influences the levels of certain hormones and is involved in the methylation and inactivation of catechol oestrogens. MTHFR: MTHFR is a key enzyme in the folate metabolism pathway – directing folate from the diet either to DNA synthesis or homocysteine re-methylation. Decreased MTHFR enzyme activity has been associated with increased premenopausal breast cancer risk with long duration of oestrogen exposure. SULT1A1: Involved in the inactivation of oestrogens and bio-activation of heterocyclic amines and polycyclic aromatic hydrocarbons. Factor V: Factor V Leiden gene mutation is characterized by a poor anticoagulant response to Activated Protein C and an increased risk for venous thromboembolism.